Marcus Montooth is a Forensic Scientist and Latent Print Unit Supervisor with the Indiana State Police Laboratory in Evansville. He has been an ASCLD assessor since 2012, and teaches Intro to Forensic Science as an Adjunct Professor at the University of Evansville. Mr. Montooth earned a BS in biology from the University of Evansville in 2001, and joined the State police in 2003 as a latent print examiner. In 2015 he became technical supervisor for the unit of 11 examiners. 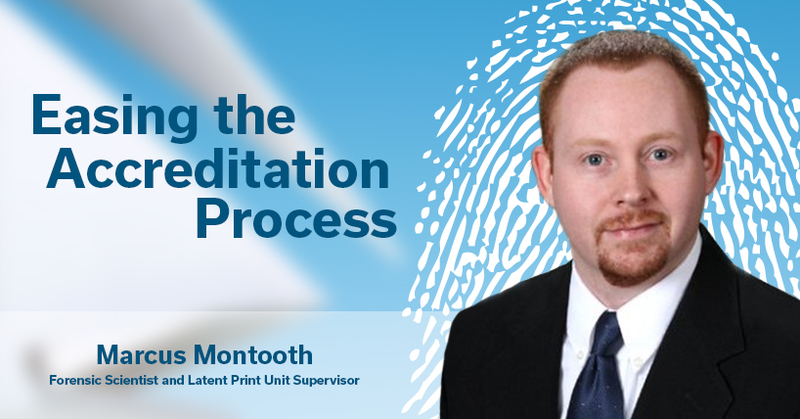 In 2011, The Indiana State Police Laboratory began using Mideo’s LatentWorks e-Latent Case Management Software, and Mr. Montooth has been central to its set up, employee training, and use. We recently talked with him about lab accreditation and the impact having a software system rather than paper-based system has. From an assessor’s view, what are the keys to getting accredited for forensic labs? As a certified technical assessor, I would say that the biggest part of accreditation is documentation. Here in Indiana, we’re accredited to ISO lab standards – but there are supplemental standards that every accrediting body has, in addition to our own internal criteria and test methods. All of these different levels of requirements have to be met. Every one of those requirements is not just that you have to do it, but that you have to document how you do it. Or that you’ve done it. How often do crime labs have to be accredited, or reaccredited? Once a year. And depending on the size of lab, it can take anywhere between 3 and 5 days. How would you compare the lab accreditation process of a paper-based documentation system to a software system? The advantage to having a software system is huge. We look for uniformity of information and processes. Are you using the right equipment? Are you using the right chemicals? Are your crime scene and other images secure and properly taken care of? With a software system like LatentWorks, for example, images are controlled once they are entered. This tells me they (the labs) are doing something to a level that they should be. The images going in are preserved, and while this is not required, by having them in this server-based system, I know, as an assessor, that their images are being taken care. What do you see as the biggest advantages to a software system? We get everything in one place – that is nice. We have our notes, all of our crime photo images, we scan in requests for lab exams and any other paper that is sent to us. While it is not an official record, for all the examiners – everything except the written report is in there. Has the increased fingerprint identification documentation improved court outcomes? Without a doubt, the added documentation makes cases more complete. We were accredited under ASCLD but switched to a stricter standard in part because of court – fingerprint analysis testimony being thrown out because of documentation, when they couldn’t tell what the original examiner was looking at to make his determination. In our case, we are now significantly more prepared for court before we even get a subpoena. Cases are not getting thrown out of court for lack of documentation. With this system, every examiner can see what information was used to make a fingerprint identification. We also set fields up to mirror our test methods, which take into account all the requirements. We can set them up with defaults – so instead of having to write notes, they are pre-filled out for us on each image, so we can’t miss it. It makes it incredibly easy for us – all of our examiners do it the same way, and if anything changes, we go in and reset the field sets, which are what you set up to input the information on the different images. We are probably higher on the documentation than a lot of agencies – but others are catching up to us as accrediting bodies are beginning to require it. And what they see is not only more information, but more relevant information? Yes. Basically, in our new environment, gone are a lot of details about what I did, and they are replaced with more important data on how I did it. As an example, say we have one (fingerprint) lift and one person to compare to. In our old system, my notes would say “one lift, one latent evaluation found compared to the card bearing the suspect’s name, compared to left index.” I’d scan the lift in, take a picture of packaging, document what’s on the package, write what’s noted on the lift by the investigator, pull the latent print, fill out an analysis of it going through levels of details – then we move on to the comparison, which is in a different program. Now, I scan in the card, do a complete comparison chart of the two and document that, and then the comparison that follows. Gone from this is what I did, replaced by how I did it. In our new system, it’s all in one place. It’s pretty easy – maybe not the only way to do it, but it is simpler. Does having an e-Latent Case Software system save time? That’s a little bit of a “yes and no” question. While it takes more time than it used, that’s because we have added so much documentation, so it is not the software. It’s hard for me to imagine what would have happened if we had increased our level of documentation and did not have this system. We have four regional forensic labs across the state – and with Latent Works we are all signed into the same server. We can review each other’s work from 300 miles away. As a supervisor, I can honestly say the quality of the work has gone up because of the documentation.